Fresh off the release of their debut album, come out. you’re hiding, Los Angeles-based, Oregon raised, flor will bring their dreamy pop melodies and infectious beats to a sold out DC9 crowd on February 20th. The band is comprised of Zach Grace (vocals/guitar), Dylan Bauld (bass), McKinley Kitts (guitar), and Kyle Hill (drums). We recently had a chance to talk with Mckinley Kitts about the band's origins, vision, and their intention to build a lengthy career as a band. Check out the conversation below. Capitol Sound DC: You are all from Hood River, Oregon. Were you guys part of any different projects prior to moving to L.A.? McKinley Kitts: We have been playing together since we were in high school. We had a few different bands and did some pop rock and other different genres. CSDC: What led you to start from scratch and what inspired you all to take the leap of faith to move together to L.A. and pursue music? MK: We saw that it was the next step --we felt that we had outgrown what we could do in Oregon. We didn’t know what sound we wanted and felt we needed a fresh community of young artists that were exploring creative outlets. Whether it was visual arts or music, we needed to be in a community that fostered [creativity]. We felt that immersing ourselves in LA it would be a way to wash out where we wanted to go with our sound so we moved to LA. CSDC: "Flor" means Flower in Spanish, why the name Flor? MK: Honestly, we just wanted something clean and simple. It’s a pleasant sounding word and it makes you feel appeased, that was the idea. It’s clean and easy, it’s not a mouthful and it’s organic and warm in a special way. CSDC: After doing some digging, I saw that before releasing any of your songs you began releasing snippets of your music with visuals by Jade Ehlers on your Instagram. What was the creative process behind these? MK: We always wanted the digital aspect of the band to be as important as the music. So we came out of the gate originally on Instagram we where releasing original stuff before we even had music. We had kind of ambiance audio we had put over so it would bounce around so we could build a beautiful spot, the page had a lot of beautiful imagery and a nice aesthetic and it was pleasant. And then we started releasing music with the visual compliment as well. Jade had the vision of how flor should look on Instagram and on the internet so we worked closely with him and did our first music videos together. Our Instagram posts were curated so that the whole feed reflected how we wanted our sounds and visuals to match. CSDC: What part did social media play in the early stages of the band? MK: It was very small for us at first to be honest but we got a lot of traction through music blogs. The website called Hype Machine basically organizes blog posts about certain songs across the board and these songs will chart depending on how many blogs are posting about them, so Hype Machine was really essential for us early on. We would get SoundCloud streams because of blog posts and the online music community. Social media and Instagram were both important but we didn't have that many followers or anything to be honest, it was like, people would hear our music, check out our social and see some nice visual complements. But until we started touring a little more heavily, social media wasn’t that big of a thing for us and then we obviously started getting more followers and now it’s a very important outlet for us to communicate with our fans. CSDC: On the subject of social media, I saw the cover of “I Fall Apart” by Post Malone you guys did on your Instagram. Which cover do you guys enjoy playing the most and which would you like to do next? MK: That’s tough, we have discussed it a lot. The cover thing is tricky because we are pretty sensitive about paying respect to the who the song belongs to originally; so I would say we are a little bit cautious depending on what we are going to do. We've only done a few, we did “Send My Love (To Your New Lover)” by Adele, we did “I Fall Apart” by Post Malone, and we did “Yellow” by Coldplay. “I Fall Apart” has been really good, people have really reacted to it well. All we have is a live version --we haven’t done a studio version of it but I kind of feel like it deserves to be in that space. As far as what’s next, that’s tough, we are heavily inspired by Coldplay and that brand of music but I think it's good to do covers that are outside of our genre. So if we do another one it will probably be something a little bit different. CSDC: The word that is used the most to describe your music is “Dreamy”, how would you describe it? MK: Dreamy is a good word. I think that Zach has kind of always aimed for "surreal" or "otherworldly." Like, if you go out on a drive in your car and you get transported somewhere. I think his voice really reinforces that idea, kind of like a floaty, airy, dreamy, if you will, voice. And we like to contrast that with some heavier guitars and some drums sometimes but overall we like to keep that dreamy feel. I like dreamy, that's good. 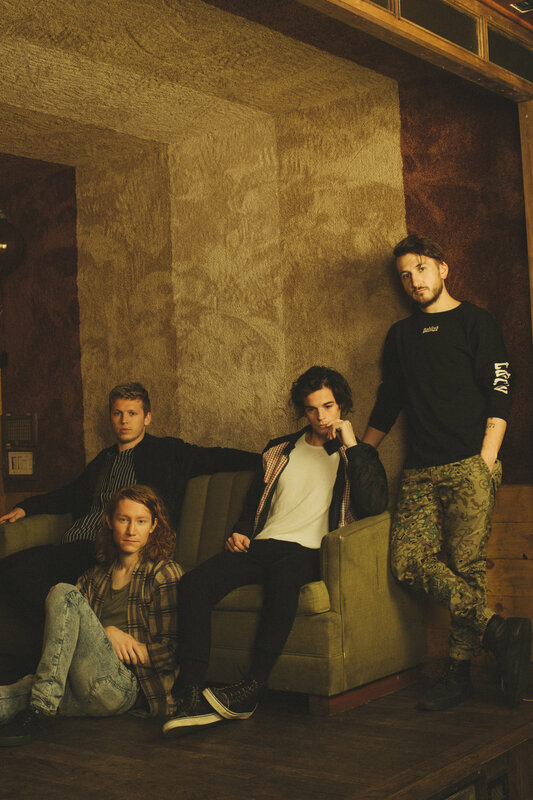 CSDC: You guys just kicked off your first major headlining tour and your Dates in New York City, Los Angeles, Chicago, Toronto, Boston, Philadelphia, Washington, DC, and Salt Lake City have already sold out! You guys also announced festival dates at Bonnaroo, Firefly, and Bottle Rock, how does it feel? MK: Amazing! We kind of put the time in early on and we always wanted to be a touring act but we’re trying to build a career not just like a flash in the pan type of band, so we were on the road a lot. We've been opening for artists that have been gracious and kind enough to take us out [on the road]. So this is kind of like the first touch, we booked a date and were kind of like “we are going to go on tour and we are going to see what happens” and we are really surprised by how well it’s done. We couldn’t be more grateful that people seem to be happy with “Come Out, You’re Hiding” and flor. CSDC: You guys recently released the deluxe version of come out. you’re hiding with 3 new songs: “Ocean”, “No more time”, and “Rely.” How do they relate to the other 10 songs on the record? MK: We wrote the songs after we wrote come out. you’re hiding and they felt more band-y. We added more guitars, they were a little darker, a little more mature. Rather than saving them for album two or for the future, we felt that they fit well with come out. you’re hiding but they were also transition songs, in a gentle way. They are not a harsh departure from the album, they add on and give some more depth to the record and still belong together, showcasing what we are as a band and showing what sounds people can expect in the future. CSDC: Is there anything you’d like to say to the readers of Capitol Sound DC? MK: Yeah! Thank you honestly, I don’t know if people are sick of hearing that but that’s all we can say because what we do is make music and we put it out and there is no way to make something connect or react or force it to happen, it has to be organic. We crossed our fingers and put a record out and if you hear our record and you like it, THANK YOU! Because all we want to do is make you guys feel good and we are really grateful to be in this position. Please note: This interview has been edited for clarity.